Product #42410 | SKU PLATFORMM+ | 5.0 (based on 1 rating) Thanks for your rating! Seize control of your productions with the Icon Platform M+ DAW Controller, adding true tactile control via USB2.0 to your Digital Audio Workstation (DAW) and production system. The all-new Platform M+ is a MIDI control surface designed for producers, engineers and musicians who want the hands on control of a mixing console and the flexibility of modern “in the box” digital music production within a smaller physical workspace. 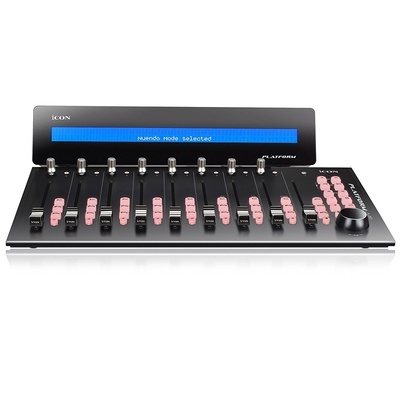 With nine (9) full sized motorized faders, eight (8) rotary dual-function encoder knobs, backlit buttons for Mute, Solo, Automation and Transport control, a jog wheel, and access to your entire mix by banking across tracks in groups of 8 or 1 channel at a time, all the primary functions of your DAW are now at your fingertips. The Icon Platform M+ integrates with most popular Digital Audio Workstations. Mapping presets for Cubase, Nuendo, Able ton Live, ProTools, Logic, Reason, Studio One, Bit wig, Amplitude and Reaper are loaded at our factory. Mackie Control or HUI protocols provide seamless interfacing with your DAW’s functions. But even if your preferred DAW is not on this list, you can still map its functions with our intuitive MIDI learn mode. The Icon Platform M+ also offers tactile control of your VST, RTAS, Direct X and AU Plugins so you can dial in EQ frequencies, Q, gain and other effect parameters with the rotary encoder knobs.